Accentuate your country style yard, garden or entryway with a grand LuxCraft Garden Wishing Well with Cedar Roof-Large! Adding charm and warmth to your outdoor scene, this Amish wishing well provides the perfect centerpiece for your flower garden, yard scene or entryway decor. Children will love to gather around the LuxCraft Garden Wishing Well. With a handle to crank the generous wooden bucket up and down, this Amish wishing well will keep little ones entertained. Enhance your outdoor photos with this outdoor structure that can display some of your prized flowers with ease! The look of your LuxCraft Garden Wishing Well is up to you! Choose to have this well built unfinished or choose the stain you like best. 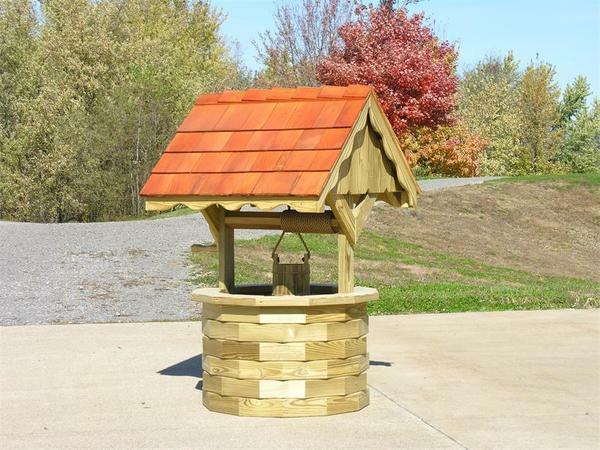 Made in Ohio by skilled Amish craftsmen, our wishing wells are made of pressure treated kiln dried yellow pine. Have you heard about the benefits of yellow pine wood? This Amish well is available in other sizes. Consider our Amish Garden Wishing Well with Cedar Roof-Medium and our Amish Garden Wishing Well with Cedar Roof-Small to find the one that suits your space best. Note: We do not include an anchor for fastening the wells to the ground.